The Canera Antique Cushion or CAC is a high performance cushion cut diamond. 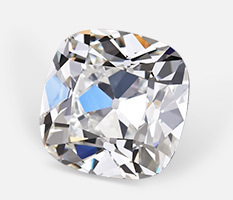 Within this beautiful "pillowy" outline, the CAC employs an antique facet pattern inspired by Old Mine Brilliant (OMB) diamonds of centuries past. This type of faceting is commonly referred to as being “broad faceted” or “chunky faceted”. These terms accurately describe the large, optimally tuned facets employed in the CAC that reflect broad flashes of light compared to modern diamonds that have a more “splintery” reflective character. The Canera Antique Cushion is a high performance vintage cushion cut diamond having optimal optical symmetry and ideal light performance and can be found exclusively at VictorCanera.com. Old Mine Brilliants sometimes referred to as “antique cushions” or "vintage cushions" came to prominence in the late 17th century. This shape is considered the ancient ancestor of the modern round brilliant diamond since it shares the same 58 facets of a modern round brilliant such as bezels, stars etc. "Old Miners" as they're sometimes called had some characteristic features such as steep crown angles, small tables, polished culets and large pavilion main facets. Due to the lack of polishing technology at the time, polishers tended to follow the shape of the octahedral rough diamond which resulted in an outer shape that was square but with rounded corners. As this shape transitioned and polishing technology improved, the girdle was further rounded yielding a pleasant pillowy shape. Over time, the Old Miner evolved into the Old European Cut and eventually into the modern round brilliant diamond that we know today. The Canera Antique Cushion came about due to our dissatisfaction with antique old mine brilliants manufactured decades and centuries ago and the need that we saw for a high performance, old mine brilliant inspired diamond. Old mine cut diamonds have been polished for centuries and were already common by the 18th century. Most Old Mine Brilliants existing today therefore are diamonds that have been handed down through the generations. These antique diamonds can be charming but also lacking in many areas. Being used diamonds, these antique stones can have, at times, severe chips, abrasions or cracks from daily wear. These stones were also severely lacking, by today's standards at least, in cut precision. It's common to see antique Old Mine Brilliants that are lop sided, with extremely poor craftsmanship. In addition to physical symmetry polishers had little to no understanding of light interaction in a diamond or the notion of light performance. The Canera Antique Cushion was born from our love and appreciation of these old beautiful diamonds that seemed to have so much character and made us fall in love with diamonds all over again. One of the main design goals for the CAC is the philosophy of merging the old with the new; to retain the character and charm of historic Old Mine Brilliant Cut diamonds yet improve them by implementing optimal light interactive properties into the design and vastly improving cut precision of these diamonds. In order to achieve these goals, the Canera Antique Cushion diamond is cut from hand selected rough diamonds and precision polished according to our CAC proprietary design. Our design entails numerous performance and design benchmarks for the CAC which can not be met by any off the shelf diamond. Whereas some vendors purchase generic antique cushions from diamond wholesalers and re-badge and re-brand them under different marketing terms, the CAC is a rare breed of stone polished from rough according to specific design specifications. The result is a truly custom diamond of the highest performance and craftsmanship. Light Performance An immediate objective for Canera Antique Cushions is the notion of light performance and the idea of producing an extremely bright diamond that interacts with light optimally. Canera Antique Cushions consistently achieve the highest grade (Ideal) AGS uses to rate light performance in diamonds. AGS Laboratories' research and expertise in this field contributed greatly in the development of the Canera Antique Cushion. The Angular Spectrum Evaluation Tool (ASET) is a ground breaking tool to evaluate the light performance of different diamonds; Fig 1-3. The ASET lays bare the level of light performance of a diamond and consistently corresponds with how a diamond interacts with light in real world surroundings. The ASET reveals issues such as "obstruction" or "head shadow" which creates areas of contrast or darkness in a diamond. Too much obstruction in a diamond can lead to a diamond appearing dark. The ASET also reveals "light leakage" which is the color white visible in an ASET scope. Light leakage is when light goes through a diamond instead of being reflected back at the viewer. Light leakage therefore would cause the background immediately behind a diamond to be visible such as skin or metal colors of a piece of jewelry. Read about Light Performance. Craftsmanship Victor Canera strives for the ultimate in craftsmanship with every product that carries our brand. The Canera Antique Cushion is a continuation of this tradition which consistently scores top grades in Cut, Polish and Symmetry with AGS and GIA Laboratories. Each Canera Antique Cushion is polished by a master craftsman with decades of experience using the latest technologies and tools. Since the introduction of old mine brilliant diamonds centuries ago, the art of diamond polishing has progressed by leaps and bounds. Whereas past stones were polished relatively crudely by today's standards, the Canera Antique Cushion uses every modern tool at our disposal to produce a diamond of beauty and symmetry. Minimal Virtual Facets Canera Antique Cushions are designed to minimize virtual facets. In short, having minimal virtual facets in a diamond gives a stone "crispness" where a viewer can more clearly make out the individual facets and facet structure of a diamond. Virtual facets are the appearance of facets caused by secondary and tertiary reflections inside a diamond before escaping out Fig. 1-1 and Fig. 1-2. These reflections of light are less strong than the first primary reflection a diamond reflects and only partially reflect light back to the viewer. These “virtual facets" therefore yield a “mushy” and incongruous facet structure in a diamond. Virtual facets cause a diamond to appear to have more facets than it physically does. Virtual facets can also cause light leakage in some cases. In other instances virtual facets produce “obstruction” (ASET blue) which cause areas of contrast in a diamond. The following photos contrast a Canera Antique Cushion (left) with minimal virtual facets to a generic antique cushion (right) with many virtual facets. Notice the clear facet structure of the Canera Antique Cushion vs. the generic antique cushion which seems to have a broken facet structure and has a less harmonious layout of facets. Uniformity Producing a beautiful diamond once is a smaller feat compared to consistently offering a great diamond. The CAC therefore is designed to be homogeneous, consistently high performing, where one stone isn't dissimilar or of a lower performance level compared to another. Although a stone's color, clarity, carat weight or length to width ratio might differ Canera Antique Cushion diamonds share the same base design and characteristics. We invite you to view our current offering of loose Canera Antique Cushion Diamonds and see why we, and the lucky owners of this gem, call it one of the finest cushion cut diamonds in the world. If you have any questions or concerns about the Canera Antique Cushion, diamonds in general, or anything else that comes to mind please Contact us or Call (888)860-6430, we will be happy to assist you.